The Courting Tree was an Ash Tree located at the end of footpath opposite the walled garden heading towards the Mansion House. It had its trunk carved out and a seat embedded into it. There is confusion over this tree and the resting tree but they are two completely different trees. The new plaque near the entrance to the walled garden says that the resting tree was carved out with a seat but this is untrue. 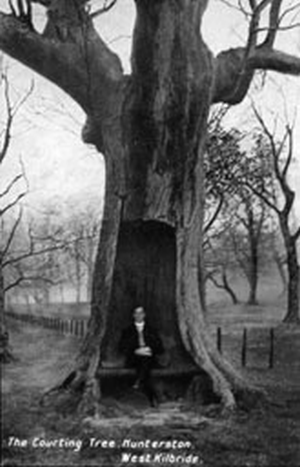 The resting tree was an Ash Tree also and located near the old Coach House and was a solid tree with no seat but the Courting Tree nearby was the one with the carved seat.